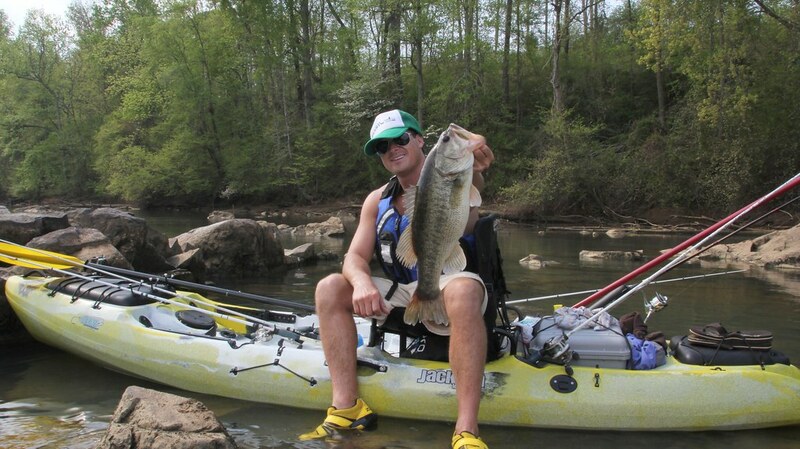 The Coosa Catches the Lunkers! 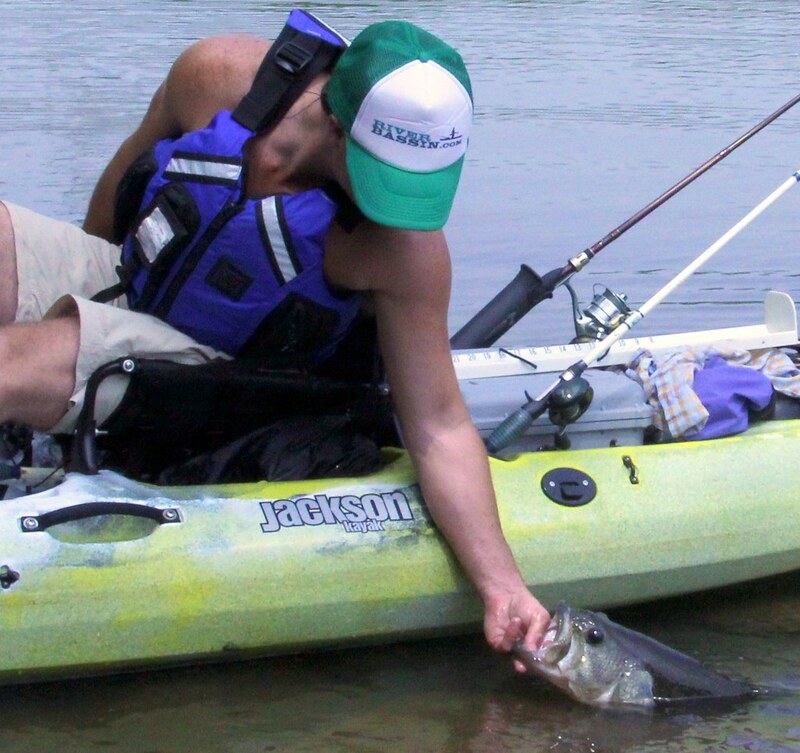 April 2nd was the first stop, of 15, on the River Bassin Tournament Trail. It was in my hometown of Charlotte and, as it does every year, it kills me that I can’t fish the events since I am the director of this tournament trail. It does, however, get me pumped up and excited about challenging myself to see just how big a “virtual stringer” of bass I can catch when I do get on the water. So, looking at my calendar and realizing I am traveling every weekend between now and July I knew that I had to go and go now. I called up my good friend “Catawba” Mike and when I asked if he wanted to fish Saturday he said, “You read my mind, because I was just tying on some lures getting ready to go somewhere.” So, we met up the next morning around 8am and got on the water by about 9am. The river was absolutely beautiful and the weather was a perfect 77 degrees. My personal goal for the day was to try and catch 70 inches from my top 3 bass; this would mean a 23 inch average. To my knowledge it has not been done but I know it is possible. I knew that this would be the time of year that it could be done too, so I was in a mindset to challenge myself to try and do something that is almost unthinkable. In my mind I was competing in a tournament against just myself and the fish and it made for an exciting day! 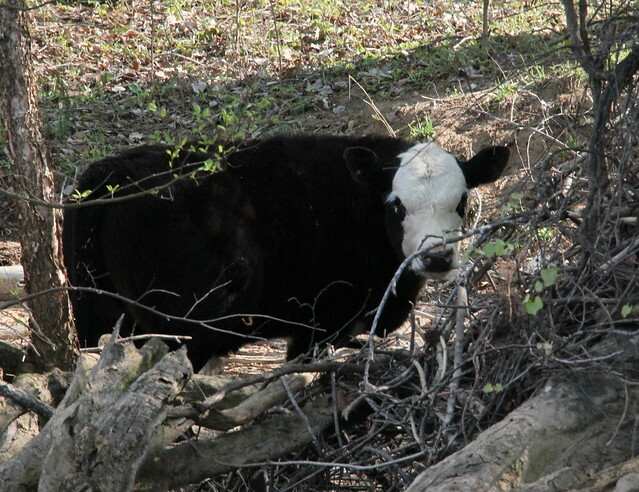 The fans lined the river cheering (mooing) for me to get it done. I was throwing a big swimbait and sticking to it despite the lack of results. However, that is the way it goes with a big swimbait, you may not catch a lot of fish, but you’re more likely to catch big ones which is what I wanted! Finally, maybe an hour or hour and a half into the trip, I get bit and man o man was it a nice one! I had made a long cast about halfway across the river in front of a section of large boulders. My little fishy I was swimming along got annihilated hard and my boat was turning some kind of fierce – a true sign that a big one is on the other end of the line. The lunker swam right under my boat and around my drag chain line which I should have prevented it from doing. It caused for some panic but eventually I let slack in the drag chain line and brought the fish and line to me despite the near disaster. It was exactly 21 inches, just under the average I needed to be at, but a good start nonetheless. After some photo and video time we let her go and I was fired up and ready to get one a little bigger so I could stay on pace. It was about an hour or two before I got bit again by anything substantial and it was another big one about the same size or maybe even a little bigger. 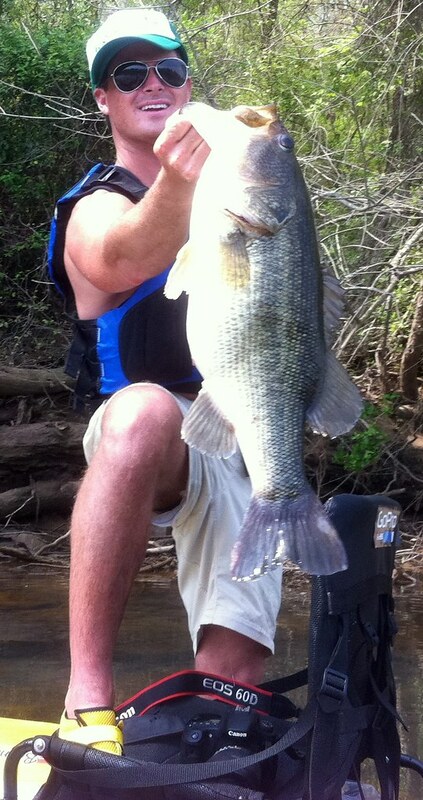 Unfortunately, this big girl jumped right in front of the Coosa and threw my swimbait right back at me. I wondered at that point if that might cost me my goal. Still, I didn’t have time to be upset and kept casting away. Not 5 minutes later I saw a nice set of submerged logs, thanks to the Coosa allowing me to stand where I could see such structure. I threw my bait by those logs and several cranks of my reel later and I got jolted so hard I nearly went out of the kayak! It was on, it was so on. This fish was undoubtedly large and in charge…of me more than I was of it. It was attempting to pull me under the various submerged logs that I caught it near and I felt its power so well through the no-stretch braided line and heavy action rod. It was a power I had never felt before, and it was the most beautiful chaos you’d ever seen on the river. And, you will see it soon enough when I make the video from this trip but my only regret is that my memory card on one of my back cameras was full so I only captured the action from the front GoPro camera. Finally, the chaos came to an end when I noticed the fish was barely hooked. I took it as easy as I could knowing that if I pull too hard the rest of my day would be a trip full of “what ifs” and trying to figure out what I did wrong. Fortunately for me, she sort of slid over my direction, opened her big mouth perfectly and I landed her about as easy as I have ever landed any fish in my life. I was pumped up and couldn’t believe the size of the fish, its mouth and especially its big buggy eyes! We snapped as many photos as we could, as quickly as we could and then filmed her being released. I did manage one photo of her on the measuring device and she was a fat 24.5 inches long. 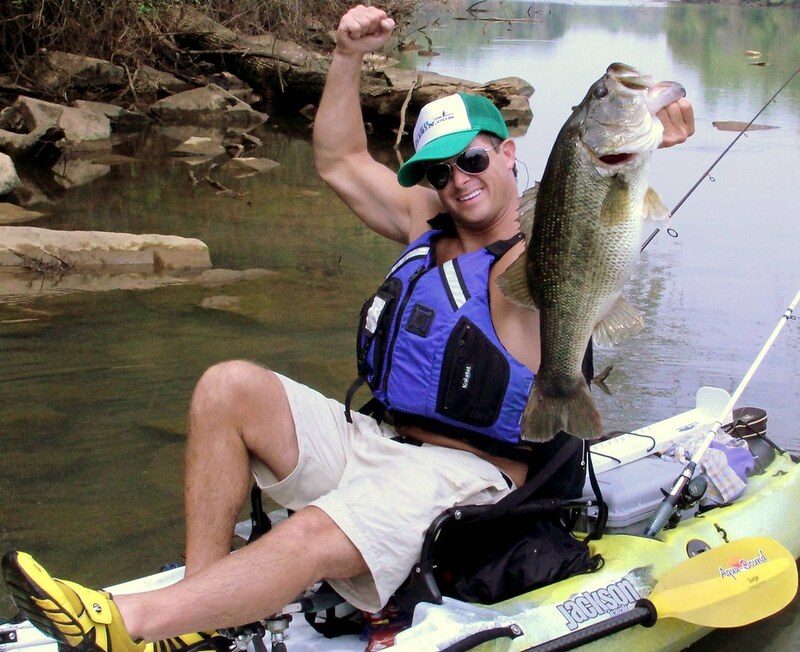 That is likely a 10lb river bass, but I suppose I will technically never know since I didn’t have a scale with me. That’s alright, a measurement is all I needed and this one had my two fish average back up to 22.75 which was basically right on pace for my 23 inch average goal that would get me to 70 inches. I also briefly thought about the one that got away thinking what if it was near that 23 inch range? I would have had it already! Oh well, gotta keep going because there was no time to waste. The next hour of fishing turned quickly into two hours with no big bite, but rather a couple smaller ones. Finally I switched up to a spinnerbait in hopes of just catching a solid 3rd fish to at least get me up over 60 inches. A windy blowdown ended up producing a nice 17.75 inch bass off the spinnerbait that got me to 63.25 inches, but I was still a ways off from my goal but certainly still having a good time. A storm started brewing in the distance that cut our trip a little short but I was happy with the day and had I not lost that one nice one I may have had it so I couldn’t complain because I got the bites I needed and only missed out on one of them. Besides, now I still have that goal to shoot for and one day I will get to 70!!! It is my new “300 game” of bowling or my “no hitter” that shouldn’t be attained easily anyway. So, look out river bass, cause the Coosa and I will be back ready to have another good time on the river in hopes of completing the mission! To see all photos from the trip that day, watch the slide show below.